Brilliant. Gorgeous. Poetic. Touching. Savage Reign is none of these. 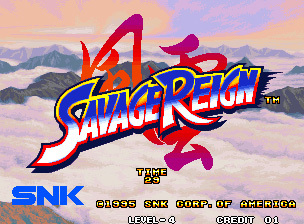 Whereas fighting games like The King of Fighters, Samurai Shodown, and Last Blade drink deeply from the SNK fountain, Savage Reign gargles. on. And when they meet in such melodramatic arenas as the Dock of Darkness and the Palace of Fun...look out! It's corny, it's cheesy, and that's it's main appeal. 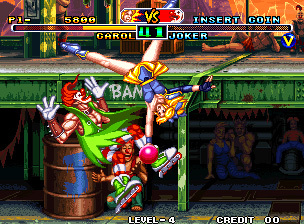 Did I mention that Carol pulls a never-ending supply of gymnastic balls out of her hairdo? 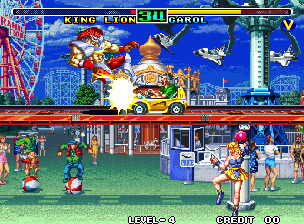 Savage Reign borrows the two-line fighting concept from Fatal Fury, but attempts to add a twist: The fighters don't just step out of the way, but leap to higher ground with a bad blur effect. 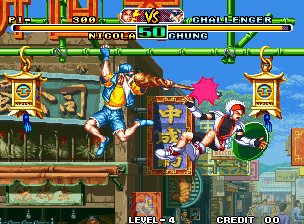 This is slightly cool, particularly in the street fight, where characters hang from a bamboo scaffold between rooftops, but coming a full five years after Fatal Fury, the concept of switching and attacking between planes is nothing new. Some backgrounds, like the amusement park, are interactive; stay too long on the go-kart track in the rear plane and a car will come to knock you down. 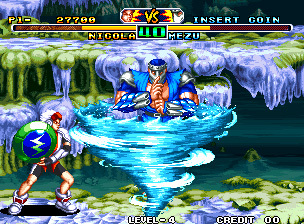 I found pulling off weapon attacks a bit tricky, but at least the button layout is familiar, similar to Real Bout Fatal Fury's. The backgrounds are a weird combination of high detail and low resolution. 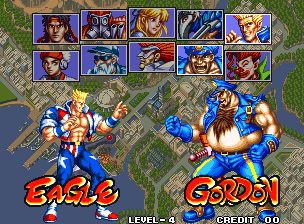 Some are slightly animated--similar in style to what Capcom was doing at the time--but they definitely don't shine. The characters lack, well, character, and the camera zooming effects as players hop between planes isn't distracting but doesn't really help either. but man, that would be appropriate. 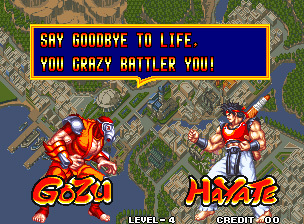 Unfortunately, the characters don't speak their wonderfully goofy text taunts. You can only take so much of this for so long. The novelty wears off fast, and when it does, so does most of the yearning to play. There are combos and special moves to master, of course, but it's not a question of mechanics--it's a question of desire.